The presence of new members in the Yang Cabinet of 2 March, 2018 gave President Paul Biya the opportunity yesterday 15 March, 2018 to dish out some guidelines to the entire government. 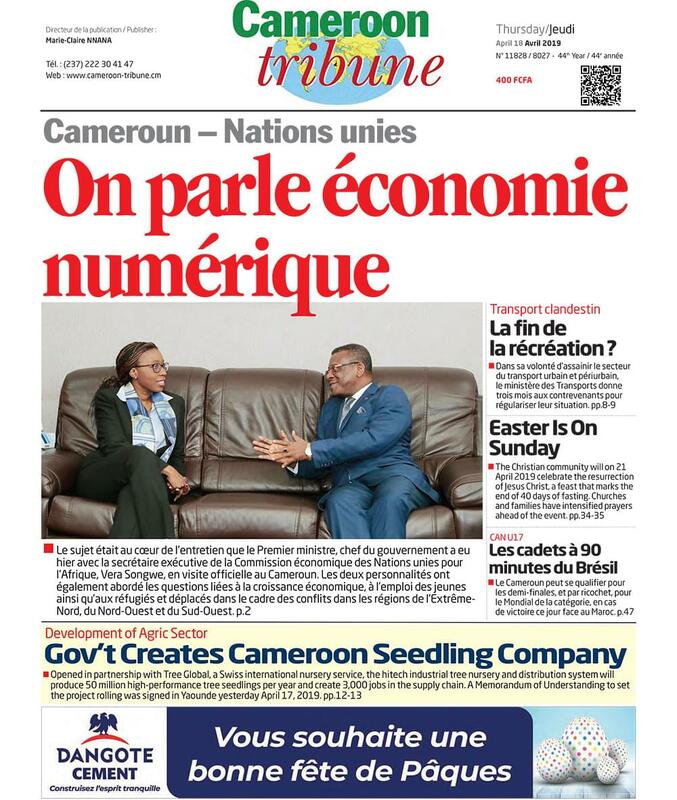 Although the cabinet reshuffle took many Cameroonians unaware, the fact that certain ministries were touched gave an indication of what the Head of State could expect from cabinet ministers. However, it was all at the level of speculations and the Council of Ministers’ meeting that took place yesterday at the Unity Palace gave an official seal to what keen observers of the national political scene were expressing. In general, President Paul Biya has never reneged on his determination to make the daily living conditions of the population better. But above that, there are several other challenges that continue to affect national life and the Head of State has remained attentive to such concerns. Thus, while it was obvious that he insisted on the need to ensure that the population gets access to potable water, electricity and other social amenities which are ongoing preoccupations, there was also a focus on topical issues like security, upcoming election of senators and preparations by Cameroon to host the 2019 Africa Cup of Nations, AFCON. As a logical follow up to past promises that the Head of State made to Cameroonians, especially during his State of the Nation address on 31 December, 2017, local governance problems have taken centre stage in most public discussions and he was ready to ensure that the people get what they wanted. Mr Biya stated in his New Year speech; “My conviction that our fellow citizens desire greater participation in managing their affairs, especially at the local level, has been strengthened by the consultations I have held and the many opinions and suggestions I have received. In this regard, it is my firm belief that fast-tracking our decentralization process will enhance the development of our Regions.” It was therefore understandable that he created a ministry in charge of decentralization. The move not only gives room for emphasis to be placed on such a problem that has led to unrest in the North West and South West Regions, but it equally enables the Minister of Territorial Administration to have enough time to ensure peace and stability as well as provide a conducive environment for various elections to take place this year. All this was clearly highlighted by President Paul Biya at yesterday’s Council of Ministers’ Meeting. The same challenge is to be expected with the organization of the AFCON in Cameroon next year. At one time it was subject of international controversy with some officials doubting the country’s ability to meet the requirements of the Africa Football Confederation. Recalling his resolve at every possible meeting with his ministers is more than just a reminder. Playing any foul game with the Head of State’s commitment is tantamount to soiling the country’s image. It is therefore important that President Biya should constantly remind those who have the responsibility to make such a promise work to ensure they do so. Coming back to the wellbeing of the population, the Head of State reechoed another regular cry which is the need to cut down on public spending. The Prime Minister Head of Government already came out with an order on 13 March, 2018 modifying and completing certain provisions of Decree No. 2000/693/PM of 13 September, 2000 laying down travel regulations for civil servants and conditions for payment of related costs. An earlier decree equally regulated travels by Board Chairs, Directors, General and Deputy General Managers all geared at reducing State expenditure. Understandably therefore, President Paul Biya at yesterday’s Council of Ministers’ meeting also had to insist on key public concerns such as the fight against corruption, unemployment and other ills that bedevil the Cameroonian society today.